I’m continuing to enjoy my summer break and having a lovely rest from Bunsen burners and overly emotional Janitors (sorry Davey). So with science firmly on the back Bunsen burner, today I’ll be reviewing the new Zombie graphic novel from Silver Fox Comics & Sorab Del Rio, Zombie Cities. Zombie Cities is a compilation of seven unique zombie tales set in cities across the world. It was written, directed and created by Sorab and visually brought to life by a small team of highly talented artists. The stories are excellent and regularly hilarious. For example, an Aussie Dad rescues his daughter from a Zombie horde, and then proceeds to endanger her by insisting she film him in action for the ‘You Tube’, a news reporter tries to be the first to interview a Zombie live on air, and the frequent use (or perhaps abuse) of George Clooney, all amused me greatly. Zombie Cities makes clever use of world locations, and world figures. They have certainly taken advantage of their freedom from costly sets, and digital effects, that are obstacles for equivalent movies. Events are set against landmarks from Sydney to London, and all are very well drawn. I was most impressed with downtown London, where Big Ben stands behind a burning red bus and zombies are lumbering forward. President Obama features in Yes We Can Kill Zombies struggling to come to terms with leading a Zombie infested nation. Here Mr. President is outclassed at shooting by his First Lady, a very nice touch. I won’t spoil it by revealing the end, but the title does say it all. If I Can Kill Em’ Here, I Can Kill Em’ Anywhere is a feel good story (something that in the Zombie genre is rather unique in itself) about Ronald Crump, a homeless man who makes good during the Zombie outbreak thanks to a very unusual law that’s put in place in New York City. In Horror at Harajuku we get a fascinating insight into Japanese teen culture as a group of girls head to fashion capital Harajuku for a day out. Only of course to encounter Zombies, and naturally, George Clooney. My personal favourite has to be God Save the Queen. I must admit my bias here. As Zombiologist Royal to the Her Majesty the Queen I do have a love for all things Elizabeth II. It opens with a brilliant reference to Earl Grey Tea, one of my Top Ten Teas. I showed it to my friends at Tea Club last week and my how we all laughed. I realise the tea based reference isn’t everyone’s cup of tea, (ha!) but to tea lovers such as myself it was a nice addition. It truly is a great zombie tale. Prince’s Harry and William make a great shadowy duo as they command a ruthless Queen’s Guard. We’re left on a cliff-hanger, so here’s hoping we see more of the Queen and her Corgi’s in future editions. Overall Zombie Cities is an excellent series of contemporary zombie stories. It strikes a good balance between humour, emotion and horror, with enough new twists on the zombie genre to make it stand out against the horde. Zombie Fans should absolutely purchase this fine novel. My Tea Club gave it five biscuits out of five, but I didn’t think that measurement system was appropriate in this instance. Please do visit the Zombie Cities Website and Book of Faces Site. 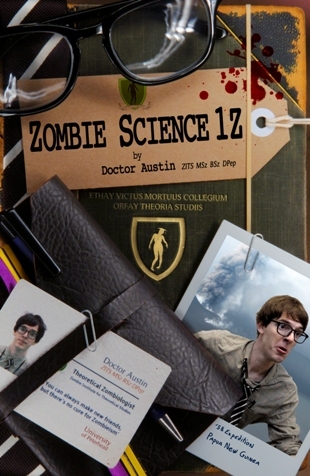 Remember, if any of you out there want to know anything about the real science behind zombies, do send your questions in to info@zombiescience.co.uk or post them on our Book of Faces (www.facebook.com/zombiescience). My wee break is almost up, so I’ll be back next time with a spectacularly scientific Zombie Science Blog.